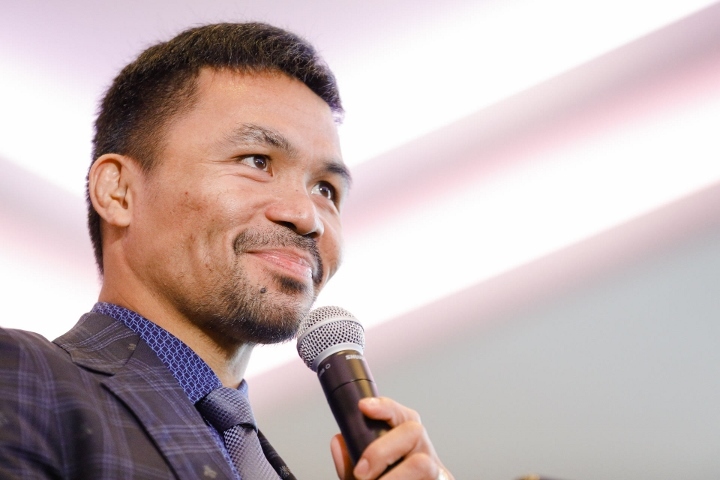 Manny Pacquiao couldn’t resist trolling Floyd Mayweather Jr. The Filipino superstar didn’t mention Mayweather by name in a Tweet sent out Monday, but Pacquiao obviously referred to Mayweather’s mismatch against Tenshin Nasukawa in a boxing exhibition. Pacquiao tagged @PBC, @TGBPromotions, @SHOSports, @ShowtimeBoxing, @MGMGrandGarden and @AXS as part of the Tweet. He also added the hashtag #PacquiaoBroner. Pacquiao clearly alluded to Mayweather’s three-knockdown, first-round demolition of Japan’s Nasukawa on Monday in Saitama, Japan. Mayweather, 41, required barely two minutes to drop the 20-year-old kickboxer three times, before Nasukawa’s trainer stepped into the ring and referee Kenny Bayless stopped their bout. The 40-year-old Pacquiao (60-7-2, 39 KOs) will defend his WBA world welterweight title against Adrien Broner (33-3-1, 24 KOs, 1 NC) on January 19 in Las Vegas. Showtime Pay-Per-View will air their 12-round, 147-pound title bout as the main event of a four-fight broadcast from MGM Grand Garden Arena. Mayweather mentored Broner at times in Broner’s career. Mayweather’s promotional company also is involved in the Pacquiao-Broner card. More than anything, though, Pacquiao hopes beating Broner lures Mayweather (50-0, 27 KOs) out of retirement for a rematch later in 2019. They publicly discussed fighting again during a music festival in Tokyo 3½ months ago. At that time, Mayweather indicated he was willing to come out of retirement to face Pacquiao again. The undefeated five-division champion claimed Monday, however, that he won’t end the third retirement of his Hall-of-Fame career.